Banana and crushed Butterfinger® candy add to the flavor, texture and moistness of this deliciously easy 'cake-mix' cake. Preheat oven to 350°F (175°C). Grease and flour 13x9x2-inch baking pan. Prepare cake mix batter according to package directions; stir in banana and 3/4 cup chopped candy bar. Pour into prepared pan. Bake for 40 to 50 minutes or until wooden pick inserted in center comes out clean. Cool completely in pan on wire rack. 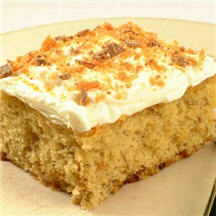 Frost cake; sprinkle with remaining chopped candy bar.